By far one of the best events for Hello Farm Organics this winter was all about our soil. Not gonna lie, we work really hard to improve, maintain and care for our soil. Its hands-down the most important part of growing healthy, tasty, and hardy organic food. We have been blessed again this year with support from Share The Love for Japan. 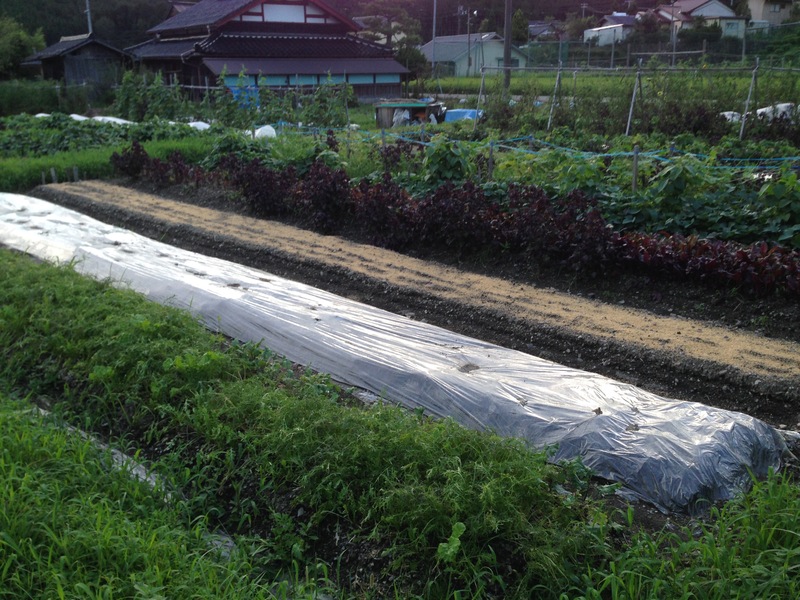 One of their projects is to support organic farmers in improving soil conditions. We were able to send soil samples to DGC Technologies for testing, specifically for beneficial soil bacteria through their Soil Biodiversity Project. This is the second year we’ve been able to do this and wow, we have learned so much! In all honesty, this is still all very new for us, but it turns out its pretty new for most of the world. 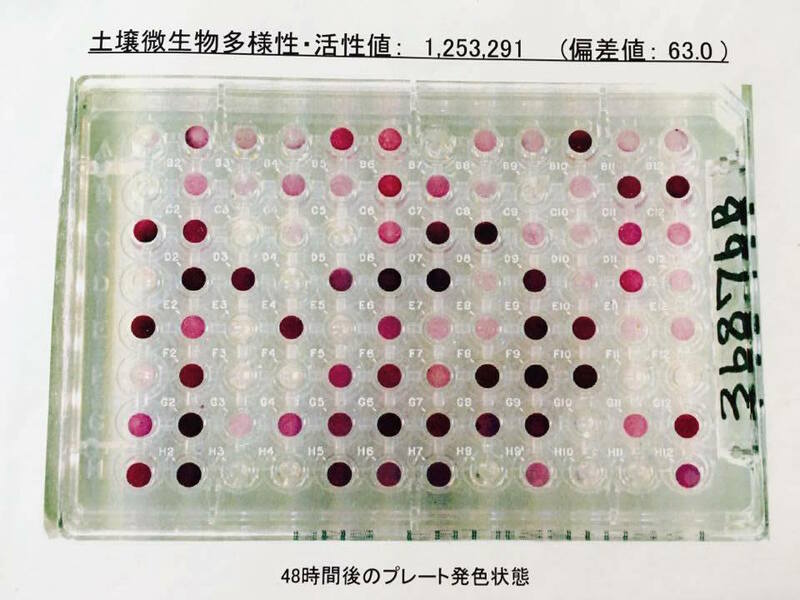 According to DGC’s website, they are one of the only research companies doing soil microbial biodiversity testing on a commercial scale for farmers, in the world! I also noticed they use some NASA technologies in their testing. How cool is that! Here’s how it works. We have also learned that the reality is, only 1% of the bacteria in soil is currently measurable, meaning 99% of the billion + microorganism in 1g of soil is not even on our radar yet in terms of classification and identification. Its just too many! 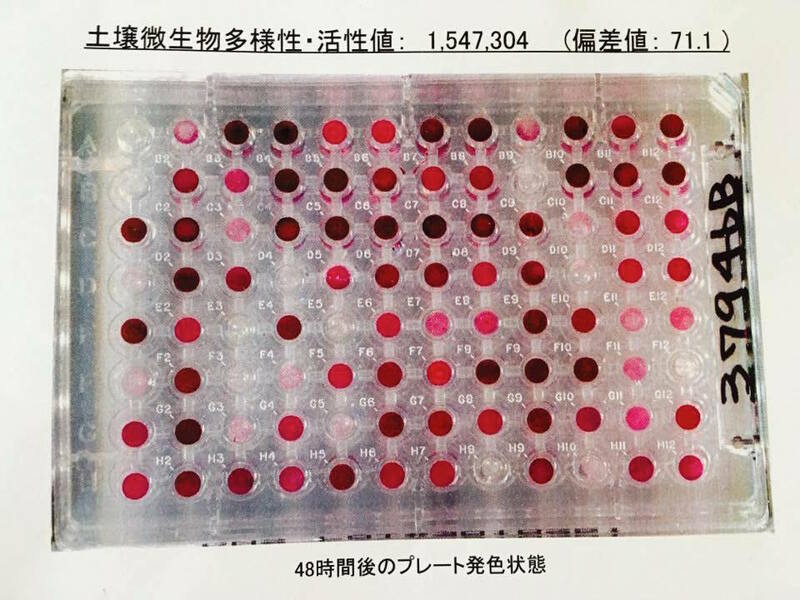 This test has been developed to measure only an average, for only beneficial bacteria, at only about 1% of the possible bacteria, in 1g of soil (over 95 trials). I’m not sure if I am explaining this correctly, or if I completely understand the process yet. I also get lost in translation with so much technical Japanese language. But being a graduate of Biological Sciences, I am super keen to learn more and decode all this fascinating information. My weary Japanese husband must feel like he is on trial with all my translation questions! I have to be honest, I am astonished at what we have been gifted here. In Canada (when I was last farming their in 2008), the only soil testing available to my organic farm business was a standard soil test that covered pH, micronutrients, Nitrogen, soil tilth and structure, extractable nutrients like Phosphorus and Potassium, and of course organic matter. This was all very valuable information when planning our next crops, amendments and processes to add to the garden. But learning about the living microbial biodiversity within our soil has really opened my eyes to a whole new way of thinking about farming. Because this is relatively newly available technology for farmers (and still very expensive), there is growing excitement and learning to be had around how soil microbial biodiversity can be utilized to its full potential. 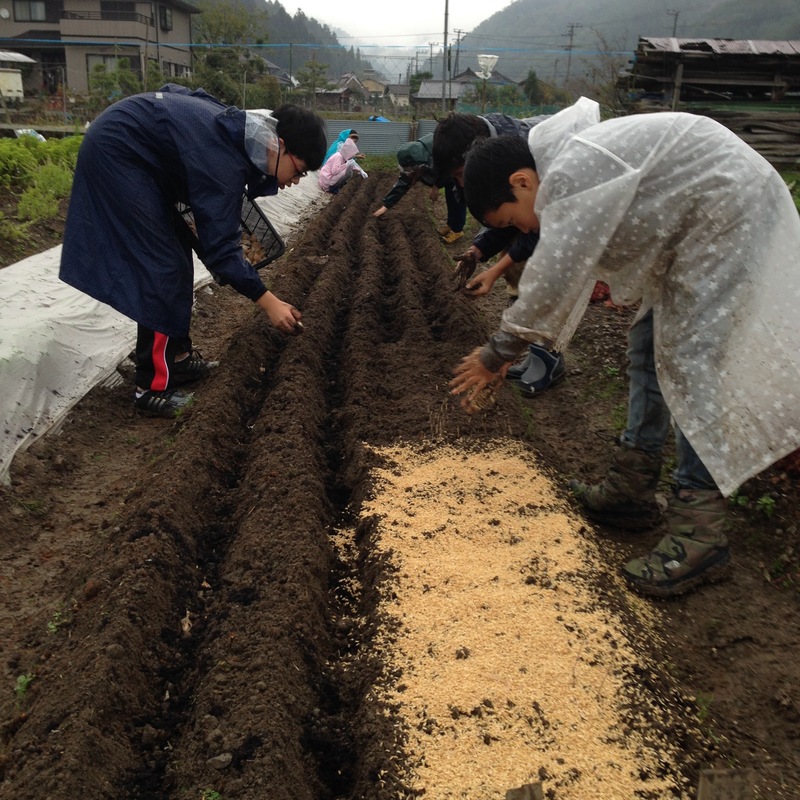 When we started farming here in Kyoto about 6 years ago, we had heard rumblings about the benefits of bacteria from our no-till farmer friends, the local organic movement, even conventional-growing neighbours that added interested amendments like sesame seed husks, rice husks, burnt bamboo and rice ash, etc. to their soil. Apparently all these things promote healthy bacteria in the soil. Japan is also a culture of fermented foods, with well-known and understood knowledge of the benefits of gut bacteria and its connection to human health. So I am guessing that its a natural leap to connect this to soil bacteria as well. I mean, it makes sense to me now to imagine that a healthy biodiversity of gut bacteria, and a healthy biodiversity of soil bacteria would both reap amazing benefits. Our next step is to figure out how to keep this trajectory going, how to manage it, and how to maximize on its potential for high yielding, delicious organic vegetables. So how did we achieve this level of diverse beneficial bacteria in our soil? Well…. Compost– We add our own home made weed compost as much as possible to our soil. We also add other composts like bark and leaf compost when we can, sometimes animal manures that’s been composted, but we have really scaled-back on animal products on the farm. The bark compost bag we buy even states that a small amount incorporated in the mix will inoculate the soil with beneficial bacteria. 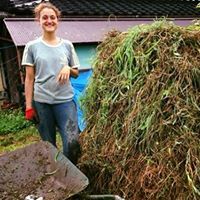 If our weed compost heaps do not reach hot enough temperatures to kill weed seeds during the composting process, we have discovered that burying the compost deep down the centre of the bed is sufficient enough to allow our crop roots to reach the nutrients, but deep enough that the weed seed cannot outcompete. Now we are making the connection that the plant diversity in our weed compost, much like Biodynamic techniques, may offer lots of beneficial bacteria as well. Garden bed prep- For most beds we always add amendments, water, rototill, and securely cover with clear plastic at least 2-4 weeks prior to seeding. I know, this is a lot of planning, but so worth it. We have noticed a huge difference in lowered pest outbreaks like flea beetles and aphids, and less weeds. The idea is the plastic superheats the top layer of the bed, killing the pest larvae and eggs that live there, but simultaneously allows beneficial bacteria and fungi to grow deeper underground, in warm moist conditions. Once we seed or transplant into this bed, the roots of our veggie crop will quickly have access to the bacteria already setting up shop below. 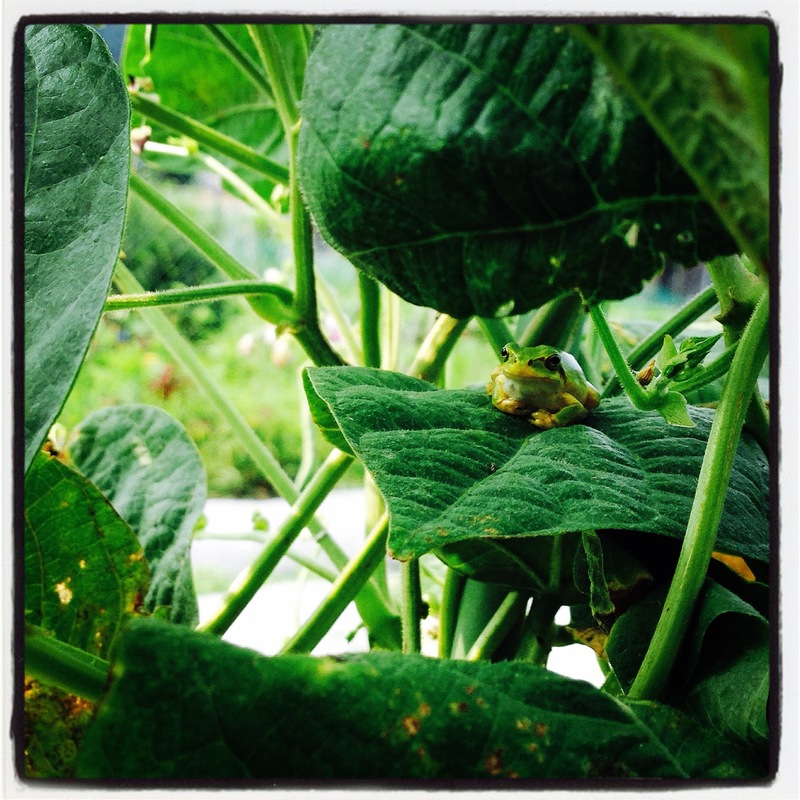 Crop rotation– We are diligent about not growing the same family of plants in one location for two consecutive seasons. We carefully map, record and plan what crops grow where, in a succession of completely different families. For example: a leaf crop follows a root crop, which follows a brassica crop, which follows a legume, which follows a fruit crop, etc. This ensures that nutrients, micro nutrients, and now possibly bacteria, are not depleted or starved out, and keeps the soil from getting “tired” with repeating crops. Zenryu is carefully planning using the garden map for each bed. Green manures and grains– Similar to crop rotation, we have also learned that letting an intensely managed veggie garden rest for a season here and there is hugely beneficial. For example, the field we had tested for microbial biodiversity was an organic rice field 3 seasons prior. We firmly believe that this is critical for “resting” the soil and in turn, probably helping the bacteria flourish, too. Green manures are similar but are often grown for the sole purpose of adding nitrogen or other nutrients to the soil, and not for harvesting grains. For example: growing clover, oats, wheat, buckwheat or alfalfa, and ploughing them into the soil before they produce grains, would be considered a green manure. We are now really wondering if our year of rice played a big role in this year’s test results. What do you think? This is the field we recently had tested for microbial biodiversity. 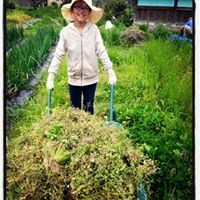 Three years ago, our amazing volunteers helped hand weed it when it was in organic rice production. That was the hardest crop we have EVER grown. Truth! This is the same field last year. We are obviously thrilled at this amazing news that our soil rocks, but we are very much aware that we are still learning a lot. We can’t say for certain that all of these techniques are directly contributing to healthy microbial biodiversity, but given our soil test results, we now feel compelled to think that our techniques very likely contributed in some way. There’s also the sheer dumb luck of acquiring great land, clean mountain water, clean air, lots of worms, and great animal and wildlife biodiversity in this part of Kyoto. We can’t wait for spring to arrive so we can forge ahead and keep studying this fascinating micro universe under our feet. I wanna be a volunteer in your farm! I’m peruvian girl and now I’m in Taiwan. What i need yo make it real? Thank you for your interest in our farm. At this time, we prefer accepting volunteers through this network: http://www.wwoofjapan.com This network gives volunteers and us farm hosts a whole bunch of advantages such as connecting with lots of host options, vetting for like-minded people, profiles for us all to read about each other (like a resume) etc. Please use this network if you wish to volunteer with us. We hope yo understand.